The Bauhaus, a school of design in Germany, was founded in 1919 by architect Walter Gropius (with the help of others). The new school came from the idea of fusing two well-know German schools of art into a state school. The two schools fused together were: the old Weimar Academy of Fine Arts and the Decorative Arts School. So, what was actually different about the new Bauhaus school, compared to the two old schools of art that had been fused together? The ideas of the school were rooted in the late 19th century Arts and Crafts movement, which was mainly a revolution against materialism, founded in the industrial revolution in Great Britain. At the new school simple design with geometrical pure forms were being taught. Because of this one could almost call the Bauhaus movement a "back to basics movement" within the art. Gropius also stressed the importance of creativity. He wanted the students to think for themselves and to come up with their own ideas. 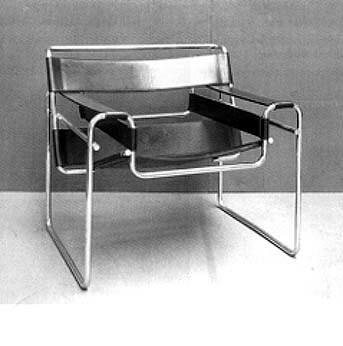 However, Gropius wanted to narrow the gap between the common people and the arts, and he also wanted furniture etc. to be plainly constructed and cheap to buy. He wanted everything to be planned and organized beforehand. 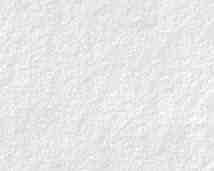 For example, even the painters had to plan exactly what they were going to do before they started painting. 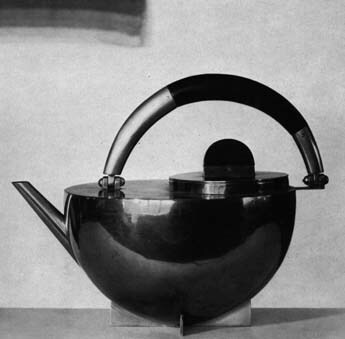 Gropius also wanted a fusion between the different types of artwork, so at the new school the professors taught: ceramics, crafts, fine Arts, photography, architecture, painting and industrial design etc. It was also of importance to Gropius to lessen the gap between the artistic side and the technological side of a finished product-Gropius was striving for unity. "The Bauhaus credo [was] that the artist, the craftsman, and the technician must be one" p. 719 Colliers Encyclopedia, volume two, 1993. Yes, one can definitely say that the beginning of the Bauhaus era was a real success. Many famous artists like Josef Albers, Ludwig Mies Van Der Rohe, Wassily Kadinsky and Laszlo Moholy-Nagy, worked at the Bauhaus. After a few years though, problems arose when some conservative members of the Weimar senate thought the school was turning into a socialistic state school. 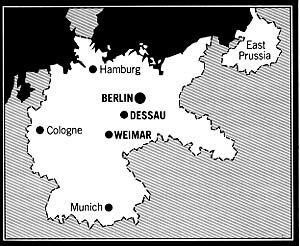 The senate decided to withdraw their support and the Bauhaus had to relocate to the city of Dessau in Germany. In 1928 Hannes Meyer became the leader of the Bauhaus school of art in Deassau, but the program did not really change under his leadership. Meyer's claim to fame, however, did not come from his leadership position at the Bauhaus; it came from the known fact that he officially accepted communism, which he showed in his willingness to spend money on a blue-collar strike. A few years later, in 1931, Ludwig Mies Van Der Rohe became to leader of the Bauhaus, and he stayed there during the last two years of its existence. Because of some difficulties, with the support of the school, he moved it to Berlin where he tried to run the school as a private institution until the Nazis finally closed it down. But even if the Bauhaus was closed down in Germany it mushroomed in other countries like the U.S., where some of the faculty and students of the Bauhaus school of art in Germany had emigrated. The central ideas of the Bauhaus were and still are alive!